Coral Islands presents gamers with a bold concept, two games in one box. 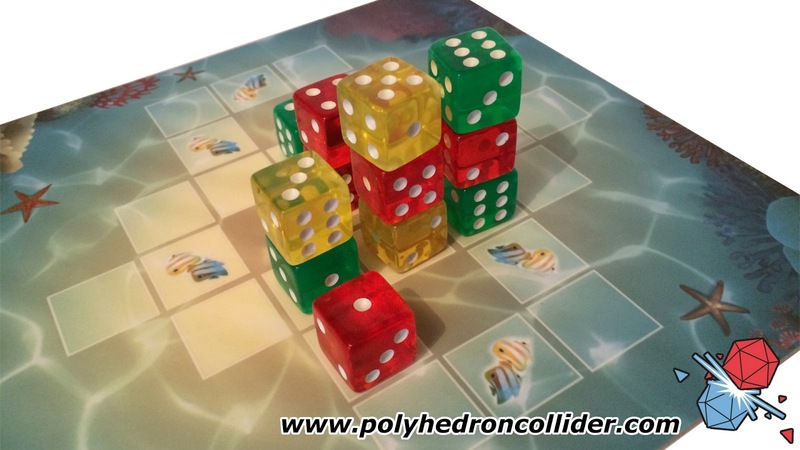 Linked by theme and components these oceanic games utilise dice stacking in different ways to give us two games that would likely have never been made had they swiped left. Lucky for us, when they met, using the Alley Cat Dating app it was a match made in cardboard heaven. Coral (who loves bright colours, 3D Tetris and jigsaw puzzles), saw something in Islands (who loves long walks on the beach, music and occasionally bending the rules) that they didn’t even see in themselves. This is a taxing, 3D puzzle game. Its a mix of Lego, Tetris and a Jigsaw puzzle. Its a type of mental gymnastics that you don’t see too often in tabletop games and in some ways it has a lot in common with a game of snooker or pool. 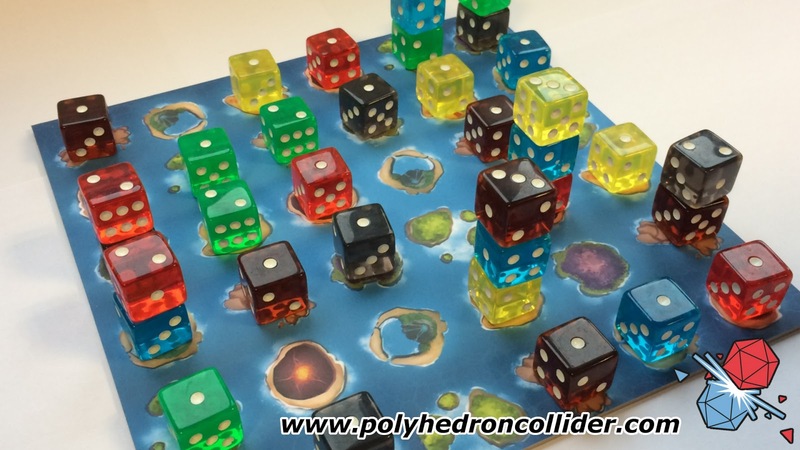 There are lots humming and thinking, twisting and turning as to try and stack your dice in such a way that you reap far more than you sow, and it does all of this in a very light game with a very simple ruleset. 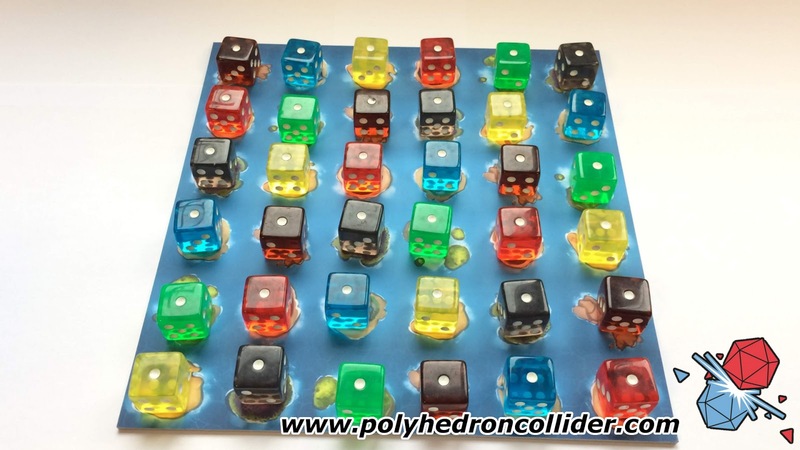 Your aim in this game is to build particular patterns with the dice. However, each pattern also requires the “assistance” of your opponents. It is the colour and shapes of coral that makes it such a spectacle. You’ll want to consider that each die you place is not only a step towards completing a structure (and gaining points) for you, but it is also a vital part of your opponent's plan. In your turn, you’ll take one of your two dice and place it on the board, either directly on to the board or on top of another dice whose value is lower (ones and sixes are wild). If you complete a coral structure you take the matching card, you then roll another dice from your pool and play passes to the next player. You keep doing this until all players have run out of dice. The fish tokens that you earn throughout the game allow some dice mitigation and even allows you to place both dice in one turn if you cash in three at a time. But in a clam-shell, that’s all the rules. There's a great sense of growth with Coral. If the BBC ever did a Planet Earth-style documentary on board games Coral would make a fantastic time-lapse video as dice spread and climb over and around the board. The game presents a really straightforward challenge, the type of challenge you would give to a toddler: “put this shape in this hole”, or “make this with these pieces”. Challenges that as adults we rarely encounter but when placed into a game they become immensely satisfying. As the game progresses the overall coral structure grows not only in size but in complexity and opportunity. I’ve found that some players will need to get up and walk around the coral, inspecting it from different angles and perspectives - DON’T YOU DARE SPIN THAT BOARD! YOU’LL THROW ME RIGHT OFF! You’ll have to be able to picture the pattern while it is partially complete and do so in three dimensions. I say this like it is some kind of revelation, and yet that third dimension to the game is a surprise. Coral depends on the assistance building of an opponent, and although you are vying for your structure, the conflict isn’t confrontational, it's more symbiotic. Because of this winning or losing doesn’t have that one-up-manship feel, you didn’t outsmart or trick your opponent you really did outplay them. Emphasis on the play, as everyone had fun completing the game and the finished coral structure. Now let’s address the elephant in the room here. There are similarities between Reef and Coral. 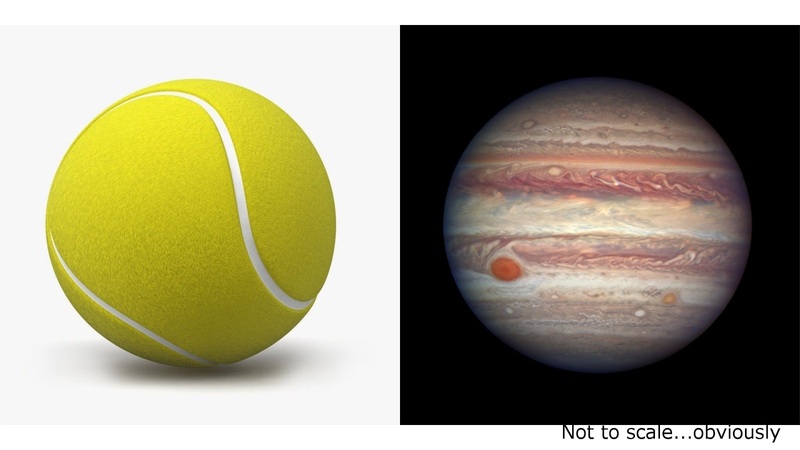 In the same way, there are similarities between the planet Jupiter and a tennis ball. Where Reef has almost zero player interaction Coral flat out needs it. Where Reef has controlled pattern building, Coral has competitive pattern recognition. But yeah, they are both about coral reefs and about stacking pieces of plastic. Where one game intensifies as it is played the other just tootles along (guess which game is which here). 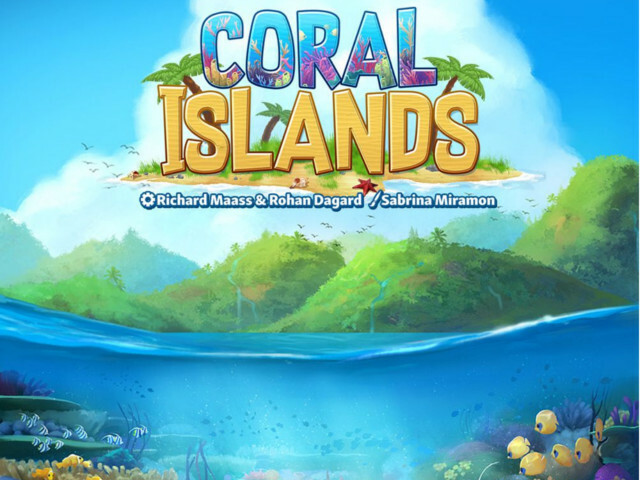 Coral offers an engaging abstract competitive puzzle of a game that plays very quickly and very simply. You’re not challenged to think competitively, but symbiotically. Where you’ll have to be aware that the patterns you are trying to build only exist in your head, and yet that there are patterns already in play just waiting to be seen. Islands is a very light and quick game with a wonderful table presence. Watching the board state evolve and change over the course of a game is quite a spectacle in itself. In many ways watching the game played often reminds me of the rise and fall of waves, or the cadence of a 3D bar chart music visualisation. 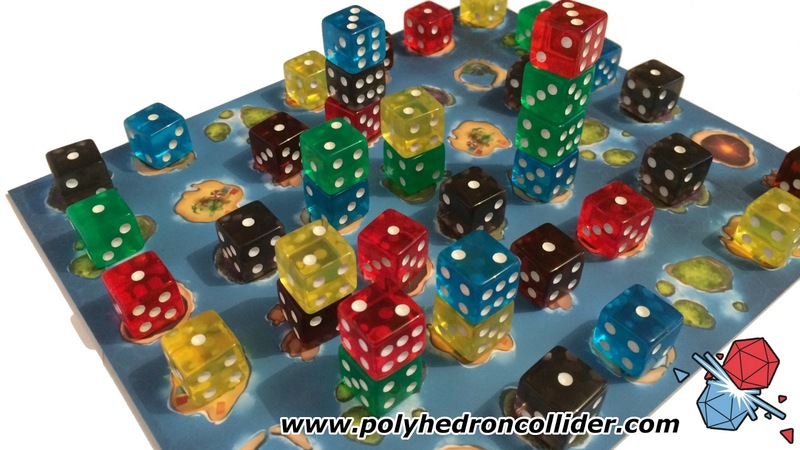 Islands is played on two levels, the board that is covered in dice, and the set collection that drives and controls the game. On your turn you’ll select all the cards that sit under one of the three specialists (these specialist bend the rules in some way), from these cards you’ll select one and add it to your private collection, discarding the rest. The colour of the card chosen dictates which colour die you can move on the board and the number of cards that were in the stack determines how many moves you get with that die. The value of the chosen die is increased by one and can then be stacked on any die whose value is lower. The game ends when all the cards are gone, at which point players count up the value of each of their different sets of cards. 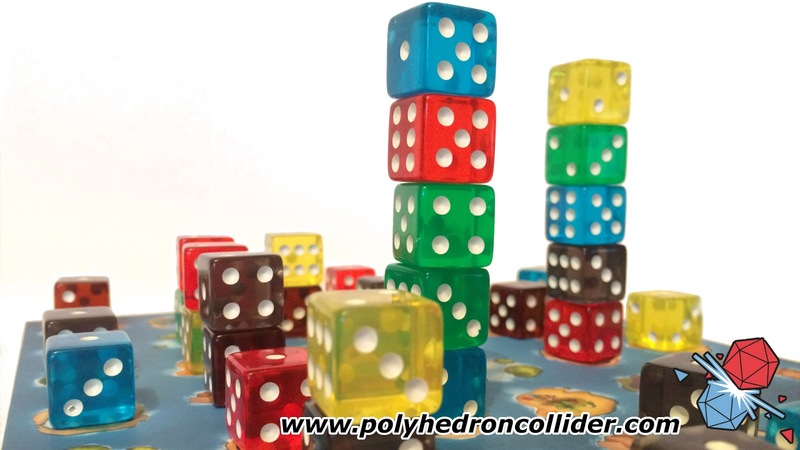 The highest in a given colour takes the tallest stack of dice from the board where the top die matches that colour. 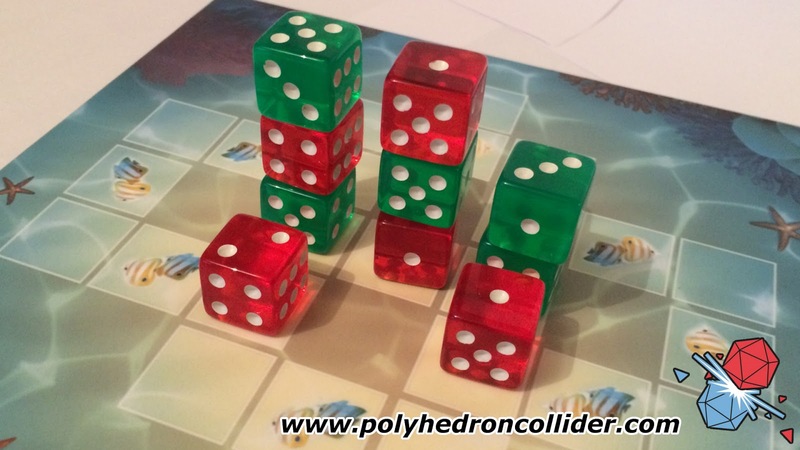 This proceeds around the table with the next highest scoring player in that colour taking the next stack and so on, until the topmost dice of that colour are removed from the board. The winner is the player with the most dice. That’s right, it’s quantity over quality of dice that is important in this one. Islands is like an inbound storm. In the beginning, there is peace and order as 27+ multi-coloured eyes stare up from the tranquil blue backdrop of the board. The wind picks up and those eyes begin to roll, leaving a dull vacancy where once there was colour. As the storm intensifies those holes yawn, growing wider and dotting the landscape with their hollowness. Towers of colour clash and combine until the storm reaches its climax. In the final moments, there is a flurry of precise and now calculated activity. And then it’s over. Stillness returns to the Islands which look very different to how they were when the game began. That may very well sound all-too-dramatic, but that is probably the unrealised poet in me. The point I’m trying to make here really is that the game, specifically the board, can look and feel quite chaotic at points, but that’s only when you’re focusing on the board and the dice stacking. 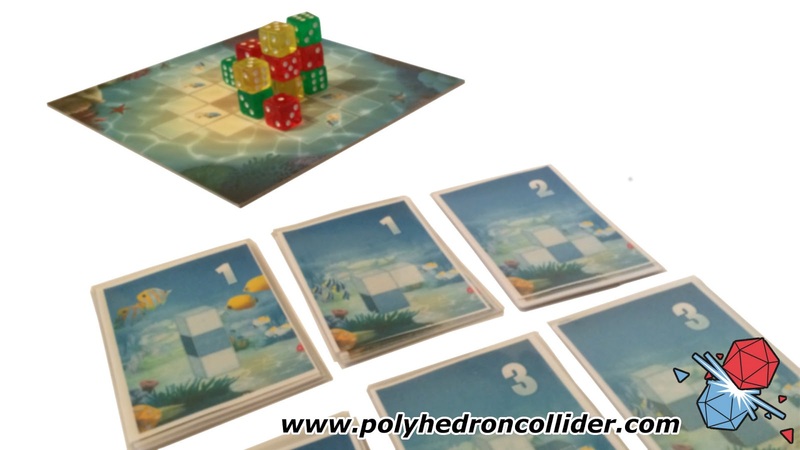 Islands tasks players to ride these polyhedral waves, take control and master them to finally create the idyllic archipelago, scoring the most points and bagging the most dice along the way. It’s in the game’s final stage when the deck of cards is running low that you can take stock of your collection of cards and from that perspective hunt for the right colour and the big stacks. You can really start taking advantage of the rule-bending specialists and cause some big, deliberate sweeps that alter the board quite dramatically in some cases. Islands is made up of small, light choices, notably, you have different types of choices at different stages of the game. In the beginning, your choices are focused on the cards and on points, with the board and dice being the secondary playing field. Later, the colour of the dice, their location and the stacks become central to everything else. You won’t be able to trace a victory or loss back to a choice you did or didn’t make, and even with the communal board and interaction, there is never the sense of player conflict. A win or loss doesn’t feel personal, you’ve ridden the storm, seized your opportunities and taken your chance to come out on top. This game really does have a sense of fluidity, it zips at a nice brisk pace, mainly due to the small, light choices that early on don’t feel like they have much consequence but the ripples of those choices last throughout the game. What Alley Cat Games have done here is interesting, brave, and to be honest, quite brilliant. 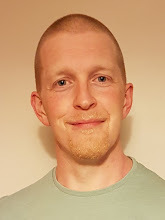 Taking two games that mechanically are very different and combining them into one package with a connected theme is setting a precedent that could change the landscape for lighter, low component games in the future. As a consumer, we get the great deal of two games for around £25, which isn’t something to baulk at in itself. Both games are great for families, for casual gamers or for those who value the ease and variety this one box will have to offer. It also leaves me wondering, do any of the games on my shelf have another possible game hidden inside them too?